Promoted: Yamaha MusicCast… what’s it all about? | What Hi-Fi? Promoted: Yamaha MusicCast… what’s it all about? MusicCast is a wireless multi-room system for people who want the latest technology and to send sound all over their house without having to give up their existing kit – kit they’ve worked hard for, and have used for years. Want a fresh system? No problem – it’s not as if you’re limited. 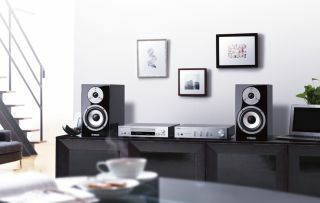 There are 23 compatible products currently in the range, from micro-systems, soundbars and stereo amps to CD players, desktop speakers and AV receivers – including the high-end Aventage range for beaming movie and TV sound. Or you can connect your own sources – any sources – and then send them across your MusicCast network to Yamaha products in other rooms. Every MusicCast product can share its inputs with anything else it connects to. And they can all handle hi-res 24-bit/192kHz material. Plus all MusicCast products come with Bluetooth onboard, so you can stream to any compatible Bluetooth product. Or from your smartphone or tablet. It’s seamless. And it’s all controlled from one app. The free Yamaha MusicCast Controller app for iOS and Android lets you select rooms, sources and songs; play separate tunes in different rooms, or bring everyone to the party with one stream. How does that sound to you? The free MusicCast Controller app for iOS and Android puts a world’s worth of music in your hand. Access streaming services and internet radio, plus NAS-based files and more – and play it all in any room. You can even customise it with pictures of your house for easy reference. Send music directly to any Bluetooth speaker from the internet, USB sticks, NAS drives, CD players, turntables and more. If you can connect it to a MusicCast input, you can stream it everywhere via Bluetooth. All MusicCast products support 24-bit/192kHz WAV, FLAC and AIFF files, and you can stream everything from MP3, WMA and AAC to Apple Lossless and DSD besides, on products across the range.